After rebuilding clutch slave cylinder, clutch wont disengage? 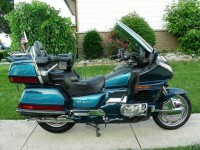 Since last year I am the proud owner Goldwing SE year 1994. Immediately after the purchase, I replace all the fluid and the timing belt. This winter I wanted, above all thanks to this forum to make some additional improvements. I changed the rear brake pads, replace the liquid in final drive, cleaned and greased drive shaft. Finally, I have rebuild clutch slave cylinder. The problem occurred when bleeding the clutch. The clutch lever is "suitable" hard, but all the time the clutch is still Engaged. Again, I bleed the system, no more bubbles, but the problem remains. The pressure on the master cylinder is OK, when the clutch lever is pressed, the piston in slave cylinder move for approximately 5 mm. Lifter rod that comes in the clutch is about 2 cm away from oil seal. When bleeding the clutch, I used all the techniques that I've seen on the forum: pumping, pushing the liquid from the bottom up, passive ventilation ..... nothing. 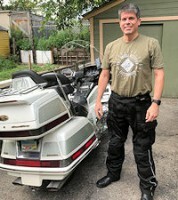 I wonder why the problem occurred because in the autumn I easily rebuild the clutch slave cylinder on brother-in-law goldwing and all work fine from the first. I will be glad on any advice, what should be done. Re: After rebuilding clutch slave cylinder, clutch wont disengage? Too many trees in the way of the problem. You may simply have clutch stiction. 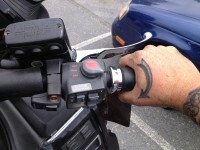 Often when mine sets up,I'll idle it..pull in the clutch lever and stuff it in gear...kills the engine. I've rocked it into gear..engine off..pull the clutch lever in and rock the bike to free the clutch plates. It is possible that the return port is clogged in the master cylinder. It is a very small hole, try a single wire from a wirebrush to poke it clear. Make sure you release the pressure at the slave or you could end up with an eyeful of fluid. Also try tying the clutch lever to the grip and leave it like that overnight (or sit all night holding the clutch lever in if you have the patience). First of all, thank you for your quick answers and suggestions. - @ Virgilmobile: as soon as I removed the motorcycle from lift I tried that too. I wonder whether, in such a short time (the motorcycle is at rest for 2 months, then I replaced the engine oil) come to this that the clutch sticky? Take a read through this post.It should answer your questions. its come the time when I can say that problem with the clutch is resolved. In fact there was no need to do anything. I turned on the engine and warmed up to operating temperature and then the clutch is started to operate by itself. Do we have any how to on rebuilding the clutch master cylinder, on the handlebaes, maybe with pictures? Hm, not yet. Maybe this weekend? Depends how much time I get (mine needs to be done, and the parts are sitting on my shelf waiting for me to do it).